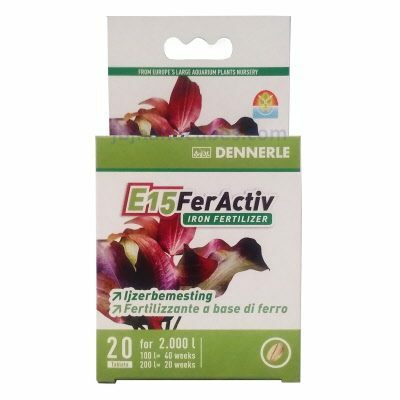 E15 FeActiv iron fertilizer provides divalent iron that aquatic plants can use immediately, ensuring that they stay beautiful and green. Symptoms of iron deficiency such as yellow, translucent leaves are almost entirely cured, while new leaves will once again show a gorgeous green color. All plants require iron to produce chlorophyll. A plant is incapable of photosynthesis without it. Please note: plants can absorb only divalent "white" iron. Unfortunately, “white” iron is unstable in an aquatic system, and is quickly oxidized to become unusable trivalent “brown” iron. Tap water has practically no iron. For this reason, consistent iron fertilization is crucial for planted tanks.